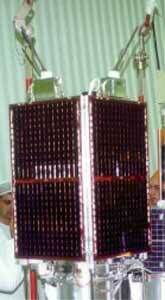 TiungSAT-1 or MySat (Malaysian Satellite) is the first microsatellite for the Astronautic Technology (M) SDN. BHD. Company (ATSB) in Kuala Lumpur, Malaysia. It was built by SSTL, at the Surrey Space Centre under a UKP 8.4m contract (1997), within a Know- How Technology Transfer Programme between the UK and Malaysia, including the installation of a satellite control centre in Malaysia. Communications. digital store and forward communications. TiungSAT-1 uses Radio Amateur Frequencies, thereby giving the Radio Amateur Society access to its Earth images and communications capabilities. TiungSAT was launched on a Dnepr launch vehicle into a 650 km orbit in September 2000 under the auspices of the Russian Space Agency. The first images from its Earth imaging cameras were obtained within just one week of launch. The battery box is the space facing facet. On the outside of this module are the VHF telemetry and command receivers, GPS patch antennas for orbit determination and a gravity gradient boom. The attitude determination and control system is based upon the proven gravity gradient and magnetorquer systems developed by SSTL. Autonomous functions, safe modes and data are handled by two on-board computers. Four body mounted GaAs solar panels provide 35 W per panel. The Earth facing spacecraft facet is the Earth Observation Platform (EOP). As well as EO instruments, the EOP contains the attitude sensors, UHF transmit antennas, momentum wheel and the CEDEX instrument.